From November 8–11, 2016, the international electronics industry will meet in Munich at the World's Leading Trade Fair for Electronic Components, Systems and Applications. Besides more than 2,800 international exhibitors, visitors can expect an extensive supporting program with four conferences and five forums. 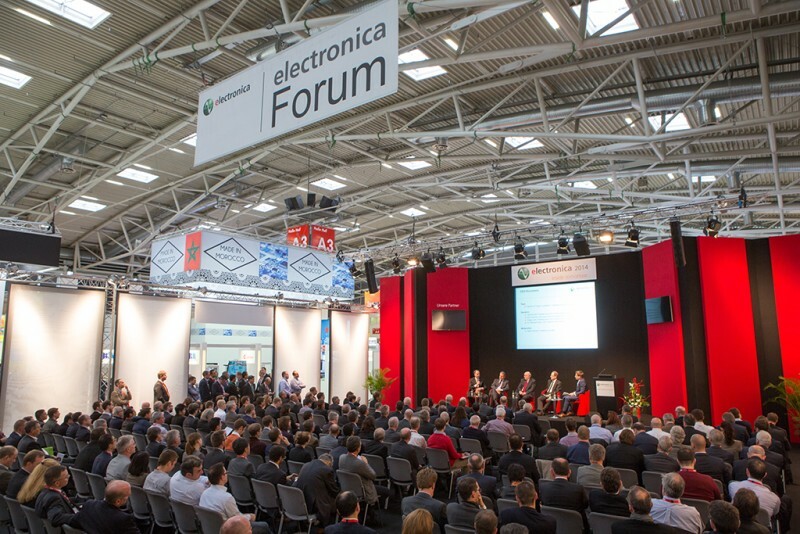 From the Cyber Security Forum and the electronica Automotive Conference to the CEO Roundtable: Experts and exhibitors will present and discuss the latest developments from around the world at electronica. With an eye on current trends, electronica 2016 will focus on it main themes, i.e. Automotive, Embedded Systems, Solid State Lighting, Wearables and Healthcare as well as the related topics of cyber security and the Internet of Things. All of these topics will also be reflected in the supporting program. One of electronica's highlights is on the first day of the fair: the CEO Roundtable. The theme is “Connected Worlds—Safe and Secure”, and leading industry representatives will gather at the electronica Forum from 11:00 to 12:00 on November 8 to discuss the role of the electronics industry when it comes to the security of intelligently networked devices. The participants at this year's CEO Roundtable are Carlo Bozotti from TMicroelectronics, Rick Clemmer from NXP, Prof. Frank H. P. Fitzek from TU Dresden and Deutsche Telekom Professor for Communication Networks and Dr. Reinhard Ploss from Infineon Technologies. The Cyber Security Forum will allow experts in the sectors for software, hardware and measuring and testing equipment to present and explain the latest hardware and software solutions for ensuring optimum security in IT systems. It will also shed light on the topics of embedded security, automotive applications and medical electronics. The event takes place at the electronica Forum on November 9. When it comes to developing high-performance LED systems, various technologies are used. The Solid State Lighting Forum at the electronica Forum on November 10 will give participants an overview. Besides the current state of the art, presentations will deal with interaction between the various technologies that are involved and how they related to one another. After the keynotes and presentations on topics such as “Solid State Lighting and Green Product Design” or “Methods and Concepts for Optimized LED Drivers”, tech-panel discussions will give experts a chance to examine trends and future prospects. On the afternoon of November 8, everything at the electronica Forum will revolve around wearables and healthcare. While the panel discussion on “Wearables for Health: Components for Digital Medicine” will explore the demands that wearables are placing on electronic components, Prof. Markus Haid from TU Darmstadt will explain how inertial sensors can help elderly people in assisted living facilities. Lectures on topics such as “Printed Electronics: Key Enabling Technology for Healthcare and Wearables” and “Mechatronic Solutions for People with Disabilities and the Cybathlon” are also on the agenda. Whether it comes to design, component cleanliness or supply-chain management, the PCB & Components Marketplace is an important gathering for the PCB, components and EMS industry. ZVEI (German Electrical and Electronic Manufacturers' Association) member countries will report on their latest solutions and products—from sensors and microsystem technology to interconnection technology. The technical information they provide will be rounded out by market data and development scenarios. The PCB & Components Marketplace takes place in Hall B4 on all four days of the fair. The Exhibitor Forum gives companies a chance to present their latest product news, developments and services in compact, half-hour lectures in Hall B5. From PCBs & EMS on November 8 to sensor technology and power supplies on November 9 to passive components on November 11: Each day focuses on a different branch of industry. From electromobility and power electronics to connectivity in the future: The electronica Automotive Conference at the ICM – Internationales Congress Center München on November 7 will allow participants to gather information about future-oriented technologies in the automotive industry. This year's conference will focus on topics such as safety, autonomous driving and interior electronics. It will include lectures on automotive software updates and 360-degree surround-sensing technologies and their relevance to safety. The electronica Automotive Forum, which takes place in Hall A6 on all four days of the fair, rounds out the conference perfectly. Can piloted driving become a reality in the next few years, and will laser light assert itself in motor vehicles? Experts will discuss the latest hot topics at the Automotive Forum. Whether sales engineers, electronics developers or supply-chain managers: Innovative solutions will be presented to everyone involved in automotive development process at the Forum. The Embedded Platforms Conference is a communication platform for suppliers of components, tools and software. The conference's topics range from “IoT and Security” and “Microcontrollers and Peripherals” to “Power and Sensors” and “Embedded Communication”. It takes place at the Messe München Press Center East on November 9 and 10. From data security in the industrial Internet of Things to ergonomics and environmental compatibility: The conference revolves around the latest challenges facing the industry. Experts will present solution approaches and discuss them in a plenary session. Whether it comes to engine-control solutions, intelligent energy or microcontrollers, the Embedded Forum in Hall A6 will also give visitors an opportunity to gather information on the latest product innovations during the fair. IT2Industry, the International Trade Fair and Open Conference for Intelligent, Digitally Networked Working Environments, will be embedded in electronica for the second time in 2016. The program of this accompanying conference includes current case studies and innovative solution approaches. IT2Industry is being held in the West Entrance at the same time as electronica. The perfect complement to the conference is the Industrial Internet of Things (IIoT) Forum, which takes place at the electronica Forum on November 8. It gives experts a chance to examine questions about hardware, software, security and data transmission in the context of industrial applications. For example, they will discuss the differences between currently available microprocessors and explain which wireless transmission media meet the latest requirements. The Wireless Congress: Systems & Applications revolves around wireless technologies for industrial use. The congress addresses developers, system designers and those responsible for wireless systems and focuses on technology trends, security aspects and certification and licensing issues. The conference takes place at the ICM – Internationales Congress Center München on November 10 and 11. They could be the electronics professionals or corporations of the future: High-school and college students, potential founders and successful start-ups. To encourage them, electronica's supporting program has events such as Student Day and the electronica Fast Forward start-up platform that are tailored specifically to young people's and new companies' needs. They give start-ups and aspiring founders a chance to present their ideas and projects, and experts will be on hand at the fair to support them. For example, other founders will share their experiences, and business angels and investors will give them valuable tips. And it all culminates in the electronica Fast Forward Award. All events, lectures and information regarding the speakers are available in the electronica event database at the following link: www.electronica.de/event-database.